I received a can of Progresso Recipe Starters as part of a Bzz Campaign with BzzAgent. I was able to pick the kind sent and I chose the Creamy Portabello Mushroom cooking sauce. I love mushrooms! I wanted to make something with it but wasn't sure what. Luckily, Progresso is aware that there are a lot of people out there not really sure where to go after opening the can. They have provided recipes not only on the can but on their website. LOTS of recipes. 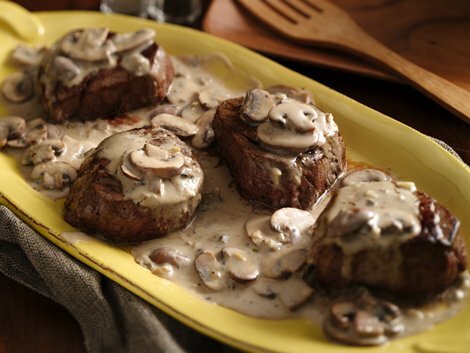 I had a hard time deciding which meal I wanted to fix but finally chose the Beef Tenderloins with Mushroom-Garlic Sauce. I have all the ingredients and it looks absolutely delicious! This is going to be our dinner tonight. I'm not sure what type of sides we will have - probably mashed potatoes and some mixed veggies.